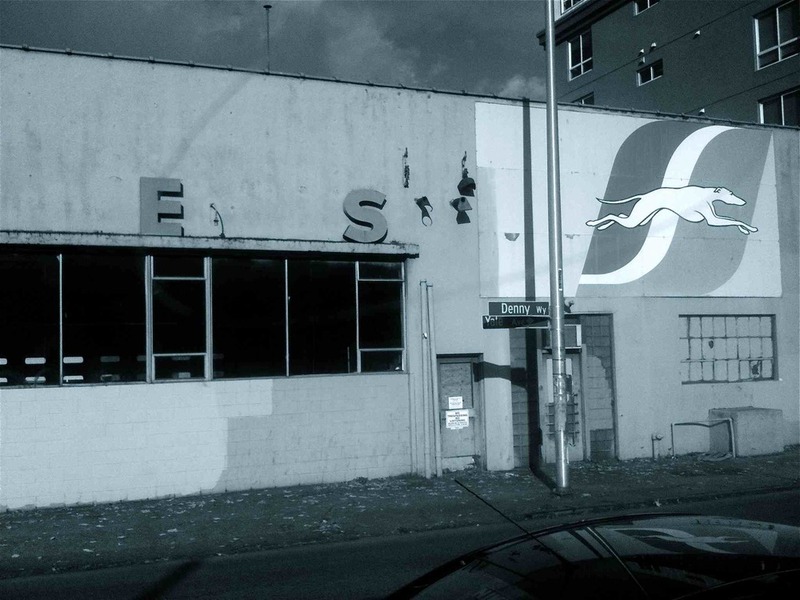 Seattle's empty Greyhound Bus Barn at Denny and Stewart, slated for demolition. "We are trying to make up time," said our new driver over the bus's scratchy microphone. He sounded as if he spoke through clenched teeth. I had seen him get on, a raisin of a man with pale eyes behind huge black-framed glasses, his mouth a lipless line. He had taken over the bus from the jolly blonde cowboy woman in Fargo, North Dakota and as we pulled away he got on the mic and informed us that as a result of the previous driver's tardiness our scheduled rest stops would be five, not fifteen minutes long and there would be no smoke breaks. Furthermore anyone not back on the bus in exactly five minutes would be left behind. "Think I'm kidding?" he rasped, "Try me." In the middle of the night I jolted awake as the bus, barreling through the dark at alarming speed, wobbled and swerved then corrected itself. I imagined us going off the road into a ditch. I imagined us crashing into a semi coming the other way. Unable to sleep I glanced at my dozing co-passengers and pictured myself weaving down the aisle and grabbing the wheel or yelling in his ear and what would happen if I did and conversely what would happen if I didn't. Suddenly we swung right, crunched through a patch of gravel and lurched to a halt. The driver turned off the engine. The bus ticked as it cooled in the night air. There was no sound of cars. I peered out the window. We sat in a vast and empty parking lot. A long, low building spanned the far end of the asphalt desert. A puddle of light from a single bulb spilled wanly over a phone booth attached to the wall. "Stay on the bus", snapped the man as he climbed down and lit up a cigarette feet from the door. Smoke wafted in with the cool air. Apart from the building, the parking lot, the bulb and the phone booth, there was nothing to see. No lights in the distance, no other buildings. The dark spread out dense and wide. It pressed up against the window. A man near me stood suddenly and made his way forward with an urgent stride. Standing on the lower step, he said to the driver, "Please sir. I have to make a phone call," he said. "Please, sir, I am begging you. Do not leave without me!" "If you're not back in one minute I'm leaving without you," said the driver, loud enough for all of us to hear. "Please sir!" said the man again as he started across the parking lot. He wore a Members Only jacket. He sounded foreign. I watched the man reach the building. He looked bizarrely small and far away. He raised the receiver and dropped in coins from the pocket of his khakis. The driver pulled on his cigarette and exhaled. He glared at the orange end of it. Then he flicked it and glanced at his watch. He climbed back on the bus and revved the engine. He closed the door. The man at the phone booth started, holding the receiver in the air as he turned his head toward us. Our tires crunched through the gravel as we swung back onto the road in the black landscape. I turned to glimpse the man running, running across the impossible expanse of parking lot, waving his arms. His mouth was open. In the distance under the light bulb the receiver swung back and forth on its silver cord. The man's bag lay where he had left it above his seat. "I told him one minute," said the driver triumphantly into the microphone.